Mindscape in Words: Happy Mother's Day!!! I'm sure every child is busy pleasing its mother today. Some might be cooking for her. Some might be gifting her wonderful items. Some might be sharing their life's important things with her. As for me, I'm neither a cook nor an orator. I am a writer. 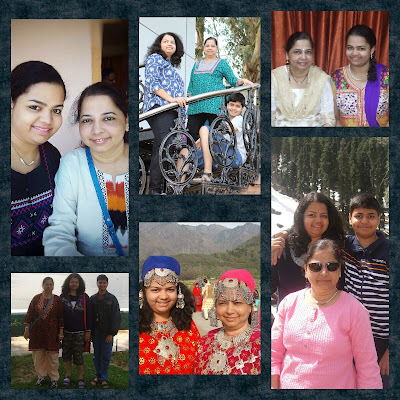 So here's me wishing my mother the happiest Mothers' Day through my words. Firstly, I will say what you already know. You make the most amazing food. I mean, there's no question about it. Everyone can see that on our family's stomachs. You give the best advice. Sometimes the answer is right in front of me and you just clear up the dust in between. You watch Grey's Anatomy with me and The Avengers with Ashwin. You are so rocking when you make references from those to mock us. I know I cannot be pro like that. You take care of all of us so dearly. You are so funny sometimes that I wonder why didn't I get that from you. You taunt us like a perfectionist and get the work done. You are such an emotional person. You can cry even by watching a tense moment in a serial. I cannot do that at all. I do hate it when you switch on the TV when I'm reading a book and at the end compel me to watch. I hate it when you splash water at my face when I don't wake up in the morining. I hate it when you force me to go to family get-togethers and ask me to talk to people. I hate it when you care too much. But now that I think of all these things, it just brings a smile on my face. You were just trying to make me a better person, in your own style. Aai, you have been my oxygen ever since I was a kid. I know, I still act as a kid. But if I won't act like that around you, then around who else? You are my pillar of strength. Whenever I throw away my books during studying or give up on getting up from the couch, you always make sure I get up and move on. If I won't act like a drama queen around you, then around who else? I act like the most raged person at home. I talk gibberish and act like a madwoman whenever I'm angry. But, if I won't throw tantrums around you, then around who else? Whenever I fight with my friends or say things like I'm done with them, you tell me to keep calm. You somehow say things so practical and true that I feel like I have no common sense. If I won't act like an innocent daughter around you, then around who else? You are my personal shopper. I know you always tell me to shop with my friends and not to bother you. I take an hour to buy one top. If I won't do all the nakhras around you, then around who else? As melodramatic as it sounds, it is only the truth. If it weren't for you, I cannot even imagine what a mess I would have been. (More than the normal, I mean) If it weren't for you, I don't know how I would have survived for even a single day. If it weren't for you, I'd just be a mean person who forgot how to laugh. Right from my morning coffee to well, my night coffee, you are always there. I cannot say how lucky I am to have such an awesome, loving and caring mother. I love you Aai! Happy Mother's Day! Awww, what a beautiful tribute and post. The love for your mom is so obvious in every word of this post! Beautiful!